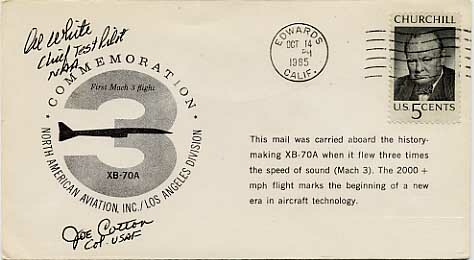 Cover Flown On First Flight of the Boeing "Stratotanker-Stratoliner"
On July 15, 1954, Boeing pilots Tex Johnston and Richard L. Loesch helped propel commercial aviation into the jet age by completing the first flight of the Boeing 367-80, the precursor for all jet-powered commercial airplanes developed since. Known as the "Dash 80," the airplane demonstrated the advantages jet engines offered over the propeller-driven engines that were then the standard. It's considered one of history's most important airplanes. With no orders or customer commitments, Boeing had spent the equivalent of all its post-World War II profit on the Dash 80. Explaining that decision in 1954, then company President Bill Allen simply said it was time somebody "got jet transport off of paper and into the air." After the first flight, Johnston and the Dash 80 toured the U.S. demonstrating what flying a jet transport was like. In August 1954, the U.S. Air Force ordered the Dash 80's first descendent -- the KC-135 refueling airplane. Boeing delivered more than 800 KC-135s between 1957 and 1965. For airlines, the Dash 80 spawned the Boeing 707. Pan Am World Airways was that airplane's first customer, signing up for 20 in October 1955. Boeing ultimately delivered more than 1,000 707s between 1958 and 1994. Boeing to date has delivered more than 15,000 jetliners, making it the world's premier commercial airplane company. The Dash 80 is displayed at the Smithsonian National Air and Space Museum 's Steven F. Udvar-Hazy Center in Chantilly, Va., near Washington-Dulles International Airport. It's near the Boeing 307 Stratoliner, the first pressurized commercial airplane. Boeing employees and retirees restored both airplanes for the museum. The B-70 'Valkyrie', with a planned cruise speed of Mach 3 and operating altitude of 70,000 feet, was to be the ultimate high-altitude, high-speed manned strategic bomber. XB-70A prototypes were under construction at North American Aviation when the program was canceled. The first XB-70A (Tail number 62-0001) made its first flight from Palmdale to Edwards Air Force Base, Calif., on September 21st, 1964. Tests of the XB-70's airworthiness occurred throughout 1964 and 1965 by North American and Air Force test pilots. The Flight Research Center prepared its instrument package. Although intended to cruise at Mach 3, the first XB-70 was found to have poor directional stability above Mach 2.5, and only made a single flight above Mach 3. Despite the problems, the early flights provided data on a number of issues facing SST designers. These included aircraft noise, operational problems, control system design, comparison of wind tunnel predictions with actual flight data, and high-altitude, clear-air turbulence. On October 15th, 1965, the 'Valkyrie' broke the Mach 3 barrier. These mementos were both among those carried aboard that historic flight. 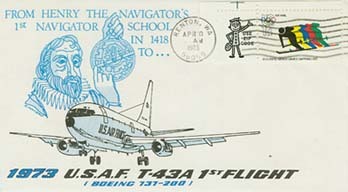 The cover bears the facsimile signatures of the two pilots, Joseph F. Cotton and Al White. The wedge is made from the silver-brazed steel honeycomb that formed the structure of most of the XB-70. It is about 6 inches in length, 3 inches in width, and about three-quarters of an inch in thickness.